Apparently in the real world I have to make things other than soup and chocolate rooted treats; major bummer for me. 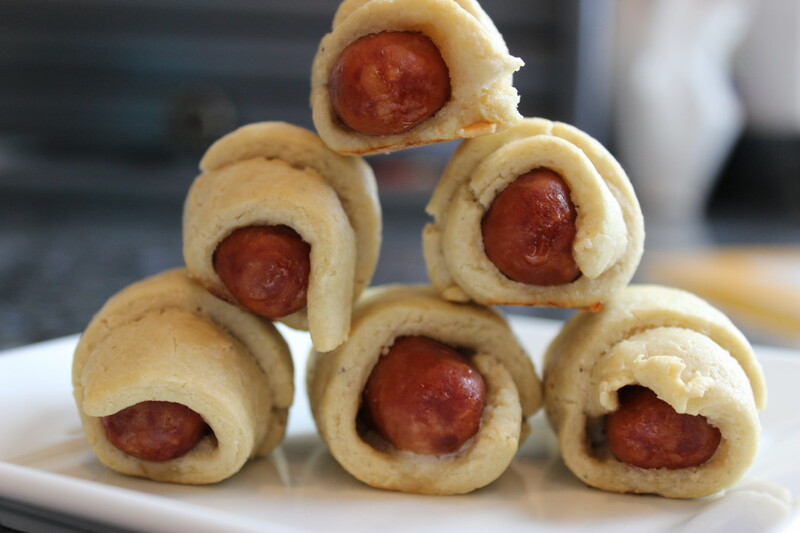 But these little paleo piggies in a blanket got a ‘thumbs up’ from all three littles who left but not a crumb on the plate, much to the dog’s disappointment. If you are newer to grain free eating, or just in search of a fun party snack, these fit the bill. 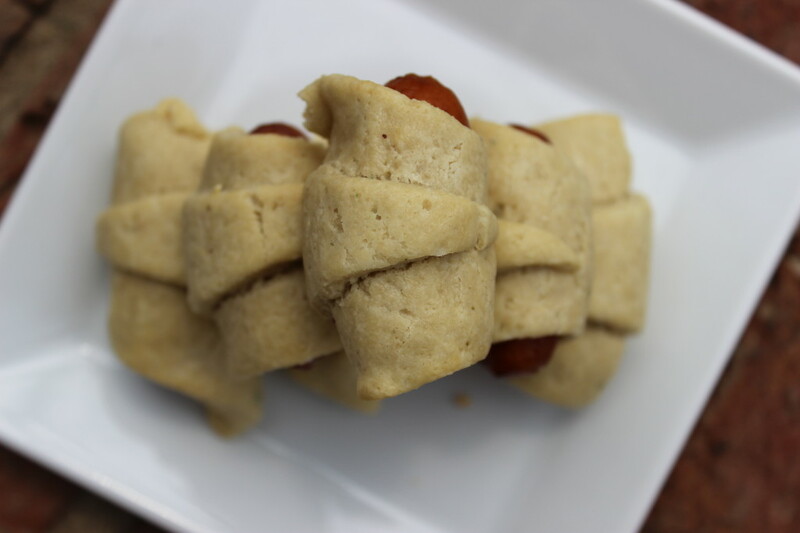 Made with cashew meal, you won’t miss the tin of crescent rolls a bit! Bake for 10 minutes or until dough has crisped up – they will not become as golden as some other versions. Serve with my honey mustard if you have time…they were gobbled up pretty quickly! Would they golden up with an egg wash? JJ, I do make my own cashew flour and find that to be the easiest to find and least expensive! You can sub almond flour, I just like to rotate nut based flours so that I do not create a food intolerance by overdoing just one (which is what happened to me with too much almond flour in the beginning of my grain free adventure). You could certainly try an egg wash – I think almond flour tends to brown more than cashews for some reason but they are still crispy on the outside once baked, and softer towards the center. Good Luck on your journey!!! *Combine all ingredients except for the piggies. LOL. I understand it, and I think most people will, but after dealing with some of the customers at my old store, I would change it. You might be surprised to find that there are folks who don’t understand that bit. My son can’t have eggs..any suggestion to still make this work? Egg replacer, Flax, chia??? Thank you so much! I know he would LOVE these little crescents!! Definitely try the flax meal sub, it should work (though I have not made them egg free YET)! I am egg free too0 and haven’t had any problems substituting flax seed meal for eggs in recipes like this. I am sure it’ll work just fine. 🙂 I plan on using flax seed when I make these! Good luck! These look great! Thank you!!!! Thanks! Hope you love them as much as we do! My kids are going to go nuts over these (pun intended 🙂 This is a fabulous recipe. Thanks for sharing. Ha Sandi! My kids did too! I even served them at my 3-year-olds birthday party and nobody knew they were grain/gluten free! This is amazing! Where can I purchase some of these ingredients particularly the flour? Look forward to becoming friends with all of you! Here is a post with some of my favorite ingredients, including specialty flours. Best wishes! I am so intimidated by all these different flours! I have been gluten free for 5 weeks. I’ve lost 4 pounds. Except for twice when I accidentally got glutened, I have felt like a new person! But I’m in a small town. I’m near a city (Charlotte, NC) but terrified to venture out and have no idea where to go or what I am doing! Is there any hope for me? Sherry, when you venture out, stick to non-marinated meats and veggies. Check out these two posts of mine: one has my favorite things (with links) and the other provides tips and tricks! Is there a substitute for arrowroot flour? That’s not a common ingredient near me and I’d rather not order it online. Corn starch?? Heather, I do not use corn starch since it is grain derived (and often GMO) – but I bet you could find some tapioca starch which would be closer in texture to arrowroot and also a root derivative (safe starch). I would love to know the servings on the recipe. We have three kids/family of 5 and it is helpful in planning to know approximately how many this recipe will make. Did I miss that somewhere? Hi Beth, all of my recipes serve my family of 5 (3 young kids). On occasion I will have a little leftover or if someone is really hungry I will be slightly short. I do not list serving sizes because I think it varies so much based on individual appetite. Hope this helps! DOUBLE it! Just to be on the safe side. Enjoy! One more question- It would be less stressful for me to make them the day before… Do you think they would hold up OK being refrigerated after they’re baked and then reheated the morning of? I think they should toast back up nicely the next day but I’ve always made them the day of to be honest! HI! could you please recommend a different flour instead of almond (i’m allergic) and cashew (my son is allergic) ? Wondering if the dough could be made ahead, and if so how long would the dough keep in the fridge and/or frozen? (My Hubby and I are excited to try this recipe!!!!) thanks for sharing!!! I think it would refrigerate short term nicely! I have not frozen it yet but it seems doable. Please let me know how they turn out!